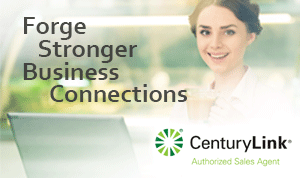 CenturyLink Business Core Connect 7 - Business High-Speed Internet and unlimited long distance phone service bundled into one low price. CenturyLink Business Core Connect 7 offers speeds up to 7 Mbps, great for small offices with multiple employees. The CenturyLink Business Core connect 7 Bundle offers speeds up to 7 Mbps, and is a great mid-level business Internet service - perfect for medium usage internet needs. Ideal for email, web browsing, file sharing, and point of sale software usage.